At the time of the Olivet Discourse, Jesus had not been arrested, tried, crucified, or resurrected so even the events surrounding even that very week was not fully clear to the disciples. At His arrest, the disciples scattered, Peter would go on to deny Christ three times, and they would watch in agony as their Messiah gets publicly and humiliatingly nailed to a cross. Even after His resurrection and subsequent forty days amongst them, the disciples were still in confusion as to what was to happen next. After Pentecost, the Apostles were now being shown by God the Holy Spirit all the things which would take place for them then and in the days to come. This knowledge was not all given to Peter or James, but to each according to their ministry and to what God wanted them to know at the appropriate time. It was to the Apostle Paul that Christ revealed the mystery of this new creation known as the Church. Pulling from an ever growing Gentile audience and consisting of both Jew and Gentile converts, the Church would become in Christ neither Jew nor Gentile. The Church would become a hybrid and unique entity conceived at Pentecost by the giving of the Holy Spirit and would continue to grow until some future point when the fullness of the Gentiles is complete. God's mechanism for transferring His attention and purposes from the Church back to Israel, is known as the Rapture of the Church. This event accomplishes several things, the first of which is fulfilling a promise Christ made to them (and us) in the Upper Room Discourse (John 14:1-3). That if He went away (He did), that He would return and take us to be where He is (He will). Then God would return His focus solely back upon the nation of Israel to finish that final week of Daniel's Seventy Weeks of which He determined (chathak) to them that He would complete the six items listed below. These things HAVE to happen. As mentioned in my article last week, God does not shrink away from revealing specific things to us and for us. On one hand, we have God revealing via the Angel Gabriel to Daniel the exact timing of Christ's First Advent to the earth as the God-Man. This ended exactly at the 69th week with the Messiah being cut off. On the other, what is not revealed to Daniel (or later to the disciples), is that there would be a 2,000-year gap in time we now refer to as the Church Age or the Age of Grace. This is a unique time for a body of believers from every tribe, tongue, and nation who are brought into the singularly-corporate body of Christ. 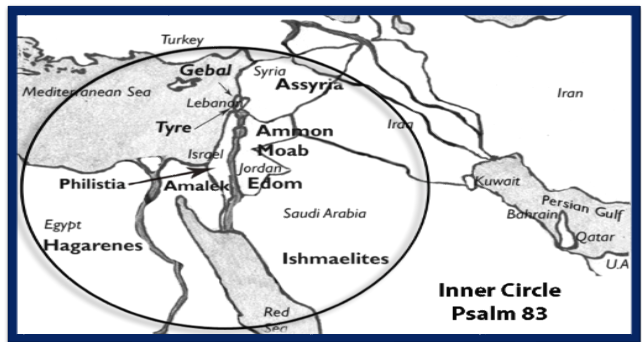 This global drawing is what Paul referred to as the fullness of the Gentiles in Romans 11:25. It is a summation of what Jesus stated in two passages within Matthew's gospel. Having now two thousand years of church history behind us, we can see with crystal-clear clarity that the Gospel has indeed gone out into all the nations. This is not to say that the Gospel has been embraced by every nation and taken root, but you can bet there are believers in every nation on earth and believers of every major tribe and tongue. Satan has worked very diligently to blanket the earth with antichristian governments and religions (e.g....Communism, Islam, atheism, etc.). So this brings me back to the original issue regarding Matthew 24:36; can we know when Christ will return at His Second Advent? What we can't know is when that final week will start. That final week will not commence until after the Church is removed at the Rapture, triggering or allowing a covenant to be made by Israel with the many (Dan. 9:27). We cannot know the day or hour of the Rapture simply because the Church as an extension of Christ Himself (we are His body), adopted heirs, and an object of His affection will continue to grow and mature until this fullness of the Gentiles comes to a culmination point. Will that culmination point be in 2017? It might be...but I do not know for certain. However, I do believe 2017 will be significant to Israel if the historical pattern holds true (1897, 1917, 1947, 1967, 1977, 1987-see previous article). The Church is the singular, corporate, multi-membered body of Christ. I am not saying that no other person (Jew or Gentile) will be saved after the Rapture. We know that they do according to Rev. 6:9-11 amongst other Revelation passages. In truth, the Gospel will continue on into the Tribulation by the 144,000 Jewish male virgins and with the angelic proclamations in the Heavens (Rev. 14:6-7), but those who come to faith after the Rapture are not Church-Age saints. Some might argue this point, but considering all the variations we plainly see within humanity, within the angelic ranks, and within creation itself, speaks volumes to the idea that within the redeemed, there is also variation and distinctions. The Church-Age saints are as distinct from the Old Testament saints (or pre-Christ saints), as they will be from the post-Rapture saints. The main distinction itself coming from the knowledge of Christ. The OT Saints knew a Messiah would come, but they didn't know exactly who, when, or how. They had faith that One would come and this time of waiting was completed with John the Baptist. The Church had knowledge of Christ and His coming but were not eyewitnesses (except for those in Jerusalem/Judea in Christ's day). We had to take things by faith and by God's word. We often get hung up with the identity of the fig tree. But whether we attribute it to the nation of Israel (Judges 9:10-11; Jeremiah 24:1-10; Hosea 9:10; Mark 11:12-14; etc. ), or not, we understand the intent of the parable. Christ said when its branch has become tender and puts forth leaves, you know that summer is near. He didn't say you may know, or you might know, but He said, you know. Christ spent His precious time and energy conveying to His disciples (and to us) these signs of the times so that we will know that the season is near, even at the doors! If 2017 holds true to historical patterns, then something significant should happen as it regards to Israel (i.e...the fig tree). That means God is getting ready to conclude this current Church Age, and return His focus back to the nation of Israel. He did not bring her back out of national extinction and diaspora, to continue on indefinitely with her and the Church Age overlapping. That overlap will come to an end just as it did before and He will finish what He started with her regarding Daniel's 70 Weeks. The Treaty of Versailles signed on June 28, 1919, ended World War One. United Nations Resolution 181 of November 29, 1947, i.e. the Partition Plan, reestablished the Jewish State of Israel. The December 13, 2007, Treaty of Lisbon, established the constitutional basis for the creation of the European Union. These three monumental agreements of the 20th Century were significant because World Wars, the reestablished State of Israel and the Revived Roman Empire are relevant end times prophetic topics. What is it about the content of this covenant that provokes the Lord to pour out His wrath upon the earth? This article presents the biblical clues that seemingly identify the TRUE CONTENT of this FALSE COVENANT. This covenant kicks off what is commonly referred to as the "Seven-Year Tribulation Period," (Trib-Period), which is also called "Daniel's 70th Week." The primary verses that provide details about the covenant are listed below. Daniel informs us that the Antichrist will confirm a seven-year covenant with many, meaning between Israel and some other party or parties. Moreover, the confirmer of the covenant will also be the one who annuls it by ending the sacrifices and offerings in the middle of the seven-years. Daniel provides some important facts, but we turn to Isaiah to ascertain additional pertinent prophetic information. * The other party of the covenant with Israel is "Death and Sheol"
* The reason Israel covenants is to avoid "the overflowing scourge"
* The covenant is deceitful, it is based upon "lies" and "falsehood"
* The covenant is made "hastily"
* The covenant will be "annulled"
* Israel will not avoid "the overflowing scourge," but will be "trampled down by it"
Bible prophecy expert Dr. Arnold Fruchtenbaum states the following concerning this problematic covenant. WHO ARE DEATH AND SHEOL? We know from Daniel 9:27 and Isaiah 28:14-18 that the Antichrist confirms a covenant between Israel and Death and Sheol. These two sinister characters bear a striking resemblance to the dual riders of the pale horse of the Apocalypse. These two horsemen have authority over a quarter of the world's population to kill people. This could mean that they kill a quarter of mankind, or that they have governing authority over a quarter of mankind to kill an untold number of people. Whichever is the case, among those being killed are Christian believers. This is confirmed in the verses below. These slain souls appear to be the victims of Death and Hades. These saints have been martyred for believing and preaching the gospel of Jesus Christ, which must contradict the counterfeit gospel being presented by Death and Hades. Whoever Death and Hades represents, and whatever gospel they are preaching, it is not a message that the fifth seal saints agree with. However, according to Isaiah 28:15, the scornful leaders of Israel will be in agreement with it, at least for politically expedient purposes. They will agree, even if it involves lies and falsehood, to avoid the overflowing scourge being perpetrated by Death and Sheol/Hades. In the Bible, death deals with the material departure of a being from its body and hades is concerned with the immaterial aspect of a person after death, which is their soul. Presently, when someone dies their soul is delivered to its destination, which is either heaven if they're saved or hades if they're not. However, the Death and Sheol/Hades that is martyring believers and that Israel signs a covenant with represents a tangible, rather than an intangible entity. Israel cannot confirm an agreement with a non-entity. So, who does Death and Hades represent? Their identity is found by recognizing that there exists only two killing crusades of Christians after Death and Hades come into the world. These two are the Harlot and the Antichrist. Per Revelation 17:6, the Harlot is "drunk with the blood of the saints and with the blood of the martyrs of Jesus." Per Revelation 13:15-17 and 20:4, the Antichrist will kill believers for refusing to receive the "Mark of the Beast." Unless Death and Hades represents a third campaign of Christian martyrdom, which is not likely, then it must find association with either the Harlot or the Antichrist. It can't be related to the Antichrist for two reasons. 1. 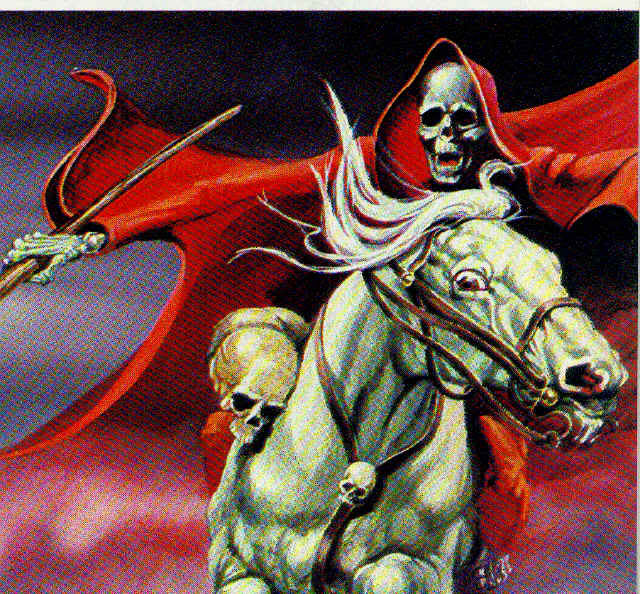 The Antichrist is the White Horseman, (Rev. 6:1-2), and Death and Hades are the Pale Horsemen, (Rev. 6:7-8), of the Apocalypse. These two horses carry distinctly different riders who operate independent of each other. The Antichrist is given a crown and instructed to go out conquering and to conquer. Death and Hades are given authority over a quarter of the earth's population to kill, namely Christian believers. 2. The Antichrist's killing crusade doesn't start until the middle of the Trib-Period, but Death and Hades begin their targeted murders beforehand. Therefore, based upon the minor premises above, the major premise is that Death and Hades seemingly finds association with the Harlot world religion. Or, more boldly and directly stated; DEATH AND HADES are associated with "MYSTERY, BABYLON THE GREAT, THE MOTHER OF HARLOTS AND OF THE ABOMINATIONS OF THE EARTH." If this is the case then whoever THE MOTHER OF HARLOTS represents, is the likely embodiment of the fourth horsemen of Death and Hades. WHAT IS THE OVERFLOWING SCOURGE THAT CONCERNS ISRAEL? What is the overflowing scourge that compels Israel to become a signatory to the false covenant? If Death and Hades represents the Harlot world religion, and if that system is perpetrating a killing campaign upon those who descent from it, then the obvious answer is that the scourge has a connection with the killing crusade of the Harlot. In other words, the Jews don't want Revelation 17:6 to read;... I saw the woman, drunk with the blood of the saints, the blood of the martyrs of Jesus and the BLOOD OF THE JEWS. And when I saw her, I marveled with great amazement. The fact is, that like the Fifth Seal Saints won't believe the counterfeit gospel of the Harlot, neither will the Jews. Coming off decisive prophetic war victories in Psalm 83 and Ezekiel 38, which will have likely happened prior, they will be on a fervent quest to reinstate their ancient Mosaic Law. This means that they will want to build their third temple to perform animal sacrifices and offerings again, which they believe will hasten the coming of their Messiah. They don't now, and they won't then, believe in Jesus as the Messiah. Psalm 83 and Ezekiel 38 are distinctly different prophecies. Psalm 83 is an ancient prophecy that predicts the conclusion of the Arab-Israeli conflict. It foretells that Israel will defeat their Arab neighbors in an epic war and end the oppression of those peoples once and for all. Ezekiel 38 prophesies that God will stop a massive invasion of Israel supernaturally. Because of both biblical wars, the Jewish state will be emboldened and recognized by the Harlot as a force that must be reckoned with. (The Outer Ring map superimposes the historic names of the Ezekiel 38:1-5 coalition over their present equivalents. The arrows depict the location of the coalition members. 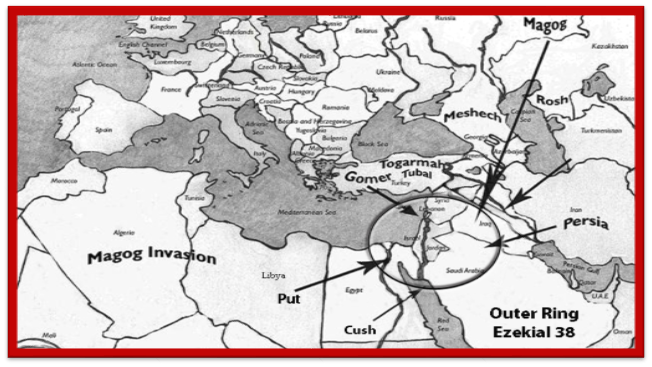 Note that the Outer Ring of nations does not share common borders with Israel, include any of the Inner Circle countries or notable terrorist organizations, involve any of Israel's historic enemies, apart from Persia at the time of Esther, or incorporate many Arab states). WHAT IS THE TRUE CONTENT OF THE TRIBULATION COVENANT? If the wars of Psalm 83 and Ezekiel 38 have concluded prior to the confirmation of the false covenant, then the content of the covenant does not likely concern the Arab-Israeli conflict. This bitter entanglement is probably over with because of these two major wars. The Dome of the Rock that presently sits on the Temple Mount and is an obstacle to the Jews for building their temple, will probably be destroyed or demolished after Psalm 83. It could easily vanish in little to no time. Additionally, there is nothing in the Scriptures that talks about the content of the covenant having anything to do with the Arab's and the Jews. However, there are at least three important biblical clues that suggest that some of the content of the covenant is concerned with the building of the Jewish Temple. The first clue is contained in Isaiah 28:16-17. These two verses are sandwiched in between Isaiah 28:15 and 18, which are the verses referring to the overflowing scourge and the false covenant. These passages use terms like a "tried stone," a "precious cornerstone," a "sure foundation," a "measuring line" and a "plummet." These are terms that can find association with constructing a Jewish Temple. To build the Temple, you start with a tried stone that becomes the precious cornerstone. This cornerstone has a sure foundation built around it. The length and width dimensions of a building needs to be calculated with a measuring line, and the vertical accuracy of a structure is determined with a plummet, (plumb-line). I interpret Isaiah 28:16-17 as a warning to the scornful rulers that drag Israel into being a signatory of this dreadful covenant. These leaders seem to think that they are going to build a Temple and hasten the coming of the Messiah, but Isaiah cautions them not to hastily enter into this covenant, because the Messiah, Jesus Christ, has already come as the, tried stone (1 Peter 2:4-8), precious cornerstone (Matthew 21:42, Ephesians 2:19-22,) and sure foundation (1 Corinthians 3:11). The intimations in these related verses above, are that by the middle of the Trib-Period the Third Jewish Temple will exist. The Antichrist will make a bold statement by entering this Temple and stopping the priestly sacrifices and offerings occurring therein. This is in fulfillment of Isaiah 28:18, which says the false covenant will be annulled. What better way to dissolve a covenant than to void out its terms? If the true content of the false covenant allowed the Jews to build their Temple and perform sacrifices and offerings inside of it, then the action taken by the Antichrist to go into the Temple and stop the sacrifice and offering terminates the contract. A third clue is in the book of Revelation. Several important details are provided in these passages below concerning the benefits to both signatories of the covenant. These verses describe what happens in the immediate aftermath of the ratification of the false covenant. The time frame of "forty-two months" is associated with one-half of the seven years of tribulation. The same increment of time is used in the ensuing verse but worded differently as, "twelve hundred and sixty days." It is commonly taught that both usages allude to the first half of the Trib-Period. Thus, the very first thing that appears to happen as part of the implementation of the covenant, is that the Temple gets measured for its construction. The apostle John is given a measuring rod and instructed to measure the temple of God, alluding to the Third Temple. If the covenant called for the construction of the Temple, then this would be one of the first order of events. Measure it so that it can be built. Isaiah 28:16 issues a stern warning for the Jews to not become a signatory of the FALSE COVENANT, but rather to recognize that Jesus Christ is the Messiah, the TRIED PRECIOUS CORNERSTONE, the SURE FOUNDATION. Unfortunately, the Israeli leaders at the time will mock all the mounting evidence that supports this biblical truth! They will blatantly turn a deaf ear to the true gospel message of the 5th Seal Saints and a blind eye to their killings by the Harlot world religion. Isaiah 28:18 declares that their scornful behavior will be to the detriment of the Jewish state. At that time, the Jews will trust that the content of the covenant will enable them to build their Third Temple. They will mistakenly believe that the completion of this Temple will cause the coming of their Messiah, who will promptly end the overflowing scourge being perpetrated by the Harlot. After their Messiah comes and promptly remedies the Harlot problem, the Jews expect that he will usher in the Messianic Kingdom, which is the high point of their Old Testament teachings. Unfortunately for these Jewish leaders, the Antichrist who confirms the covenant will be the one who annuls it! The Antichrist will kill two religious birds with one stone in the Middle of the Trib-Period. First, he will enlist ten powerful kings to desolate signatory #2 of the covenant in Revelation 17:12-17. Shortly after eliminating Death and Sheol/Hades, which typologically represents the Harlot world religion, the Antichrist will enter the third Jewish Temple and stop the priestly offerings and sacrifices. This abominable act will ANNUL the FALSE COVENANT in fulfillment of Isaiah 28:18 and Daniel 9:27. Then, the Antichrist will proceed to eliminate signatory #1 of the covenant by committing the final genocide attempt of the Jews. Zechariah 13:8 informs that two-thirds of the Jews will be killed during this time. In the end analysis, many Christian believers, Jews and the pagan Gentiles of the Harlot world religion are ultimately going to be killed at the cost of this terrible covenant. Israel's participation in this accord acknowledges their general acceptance of the Christian persecutions by the Harlot. Unwittingly, they and the Harlot trust the Antichrist to meet their mutually exclusive ends, which are the advancement of their own respective religious agendas. However, the Antichrist has his own different religious agenda as per Revelation 13 and elsewhere. Upon annulling the false covenant, his plans to entirely control the world are implemented. Now we know why the TRUE CONTENT of the FALSE COVENANT amounts to nothing more than a truly BAD DEAL that comes out from the PITS of HELL! JESUS, ARE YOU STILL COMING? What does 'walking after their own lusts' mean in this context? 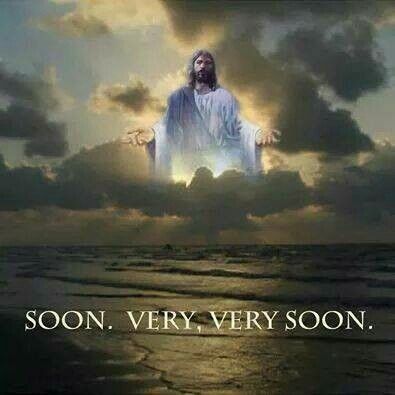 Have you ever thought to yourself, (either seriously or not) "I hope that the Rapture will hold off until . . . ". The reasons can be legion: "Until I get married. Until my baby's born. Until I get that new promotion. Until I see my first grandchild. Until I retire. Then, as the reality of your own mortality really sinks in, it becomes "Even so, come, Lord Jesus." And suddenly, you're not walking after your own lusts anymore. And you're pretty proud of yourself. From time to time, along comes some event or happening around which Bible prophecy watchers close ranks announcing, "This is it! He's coming soon!" When the end doesn't come on schedule, they are discouraged. And worse, those with whom they shared their insights are now confirmed scoffers. Not to mention the disappointment of the believer himself, especially a new believer. All that can be damaging beyond our capacity to comprehend. Who are the scoffers that Peter is talking about? Most of us assume they are unbelievers and that this verse is talking about how hardened people will become to the Gospel in the last days. If one reads it carefully, however, one realizes that Peter is talking to believers damaged by somebody misdirecting their faith away from Jesus and into believing in some personal interpretation of prophecy. We've discussed in back in 2009 the teaching that we've already entered the Tribulation Period and that Javier Solana is the antichrist. Except that Solana's due to retire in October, coincidentally, JUST in time for the Rapture. Every year at Rosh Hashana, (usually late September or early October) somebody announced they have cracked the mystery of the exact date of the Rapture than that it will either be the last day of the Feast of Trumpets or, alternatively, on Yom Kippur, the Day of Atonement. These are usually accompanied by complicated calculations of days and weeks divided by months starting from some significant starting point - most recently, the 1967 capture of Jerusalem. Nobody else can decipher the calculations, but the argument is so compelling that nobody bothers. Here is the logic. "Every one of the major miracles in the life of Jesus corresponded to a major Jewish feast day. The only two feast days for which there is not a corresponding major miracle are Rosh Hashana - the Feast of the Trumpets - and Yom Kippur, the Day of Atonement." This makes PERFECT sense to me. 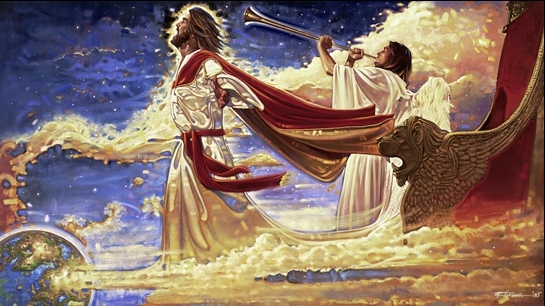 The Rapture begins with the blowing of the "last trumpet." And Yom Kippur is the Day of Atonement. Jesus died to atone for my sins and on the Day of the Rapture, I will be caught up with Him, completing my atonement process! It is an entirely logical assumption. It is extremely compelling. Heck, it might even be right. Except it isn't. Every year, both days go by and we're still here. We didn't go last time around. Probably won't go this time around. And it is just as likely that when we DO go, it will be Good Friday, Easter -- or maybe Labor Day. Religion is bound up in calendars. If we're going to put our faith in a calendar date, it would be helpful to know which calendar God uses. Does God follow the Jewish calendar? Then today is 22 Iyar, 5773. Does He follow the Gregorian calendar like we do? Then today is May 2, 2013. If God follows the Julian calendar, then today is April 19, 2013. Other choices include the Islamic calendar, the Coptic calendar, the Chinese calendar, the Ethiopic, the Persian, Mayan, French . . . what about the digital ISO calendar? God invented DNA. Maybe He works off computer time. But that's not the way people are wired to think. It is ENTIRELY natural for Americans to think of God as an American. From there, it isn't that far a stretch to assume He thinks like they do. Then when He fails to conform to the image in which people have reconstructed Him, they become scoffers. Who are the scoffers? They aren't skeptics, or atheists. Read Peter's assessment again. He tells you not only who they are, but WHY they became scoffers. They are believers who got burned by bad doctrine. As students of Bible prophecy, we have an awesome responsibility before God because we KNOW what the scoffers don't. Bible prophecy is not gloom and doom, but is instead hope and a blessed assurance. It is proof positive that God remains on His Throne and that He WILL do all that He has promised. If it doesn't take place on schedule, the predicted date is only relevant in that it provides the skeptics with more ammunition to discredit both the Message and the messenger. We are to be waiting for the Deliverer from wrath, not the wrath itself. To the lost the Lord will come unexpectedly like a thief. But to believers who are expecting Him and do not sleep, Christ will not come "as a thief." We're to be witnesses. Not storytellers. IS THE ORACLE OF DAMASCUS CLOSE?